Design trends have a funny way of coming around full circle. It’s in, it’s out, it’s back in again. 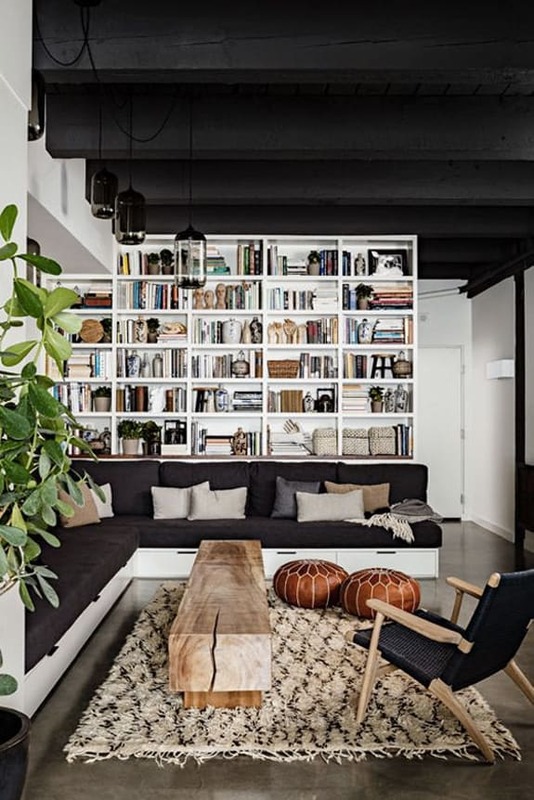 There is a big swing towards the mid-century modern (which I LOVE) and a whole slew of “era’s gone by” style that is making it’s way back into today’s design field. Here are three trends I love seeing back in style. First is the sunburst mirror. These have been back for awhile and the trend still hasn’t lost it’s footing. There are a ton of DIY’s out there and so many different styles to choose from that you wouldn’t have any problem finding just the right one. 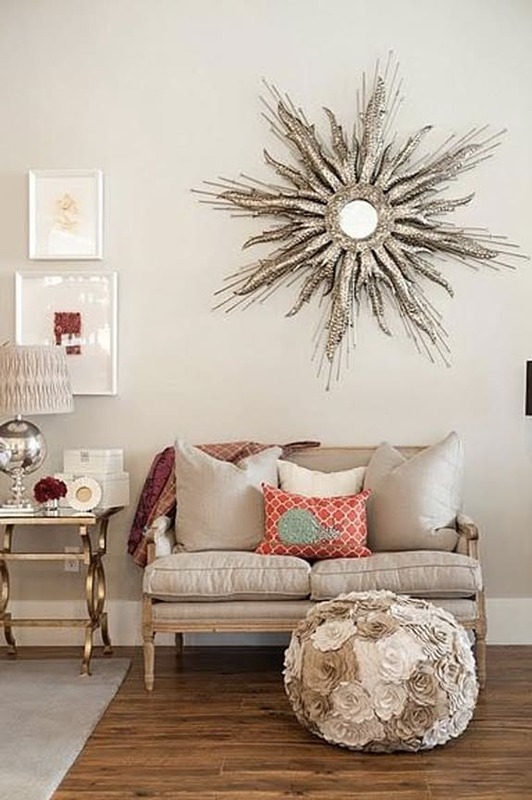 Sunburst mirrors (also commonly called starburst) have come a long way since the days of old, but the vintage ones can still hold a candle to the new ones out there. 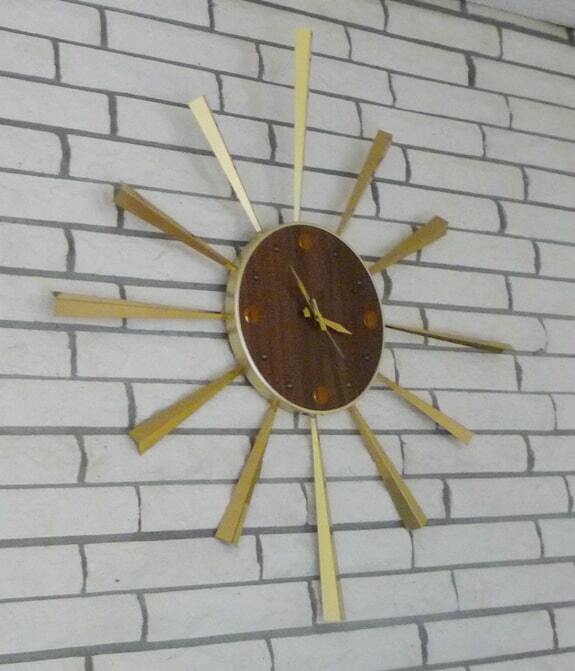 Check out this sunburst clock from our house when we moved in. Straight from the 70’s into our living room. Very sadly, I wasn’t with the trend yet, and this gem got tossed. Of course I’m kicking myself now! You can’t go wrong with a sunburst mirror (in my opinion)! Is this a trend that should rise like the sun, or should it burn out? 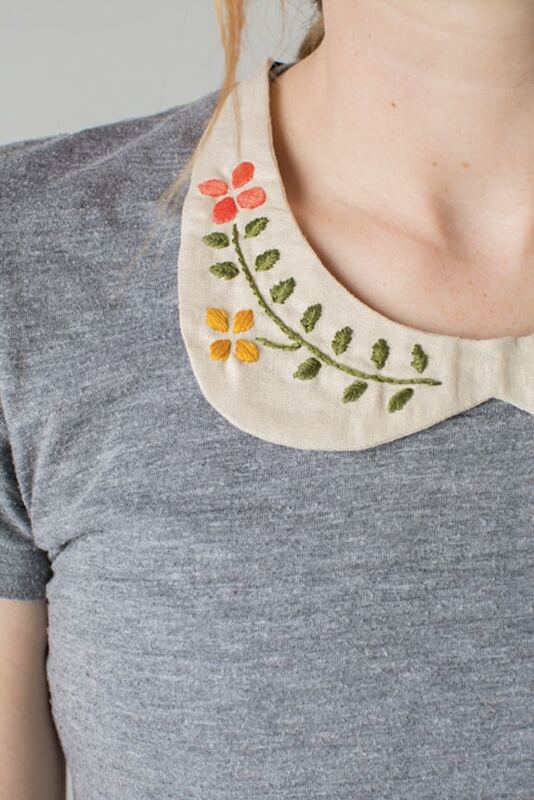 The next trend I’m loving right now is hand embroidery. 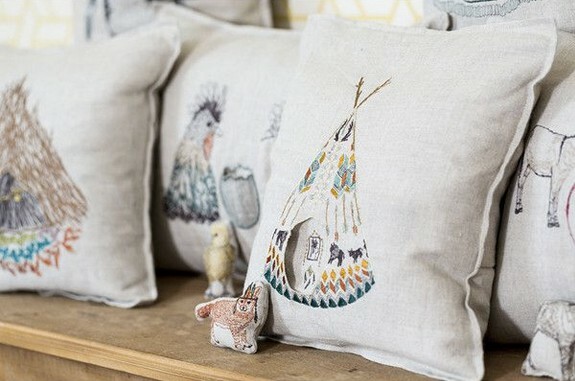 It’s definitely not the hand embroidered tea towels you remember adorning your grandmas oven handle or the old embroidered sofa pillows that smelled of moth balls. With a fresh take this trend has become modern and fun! 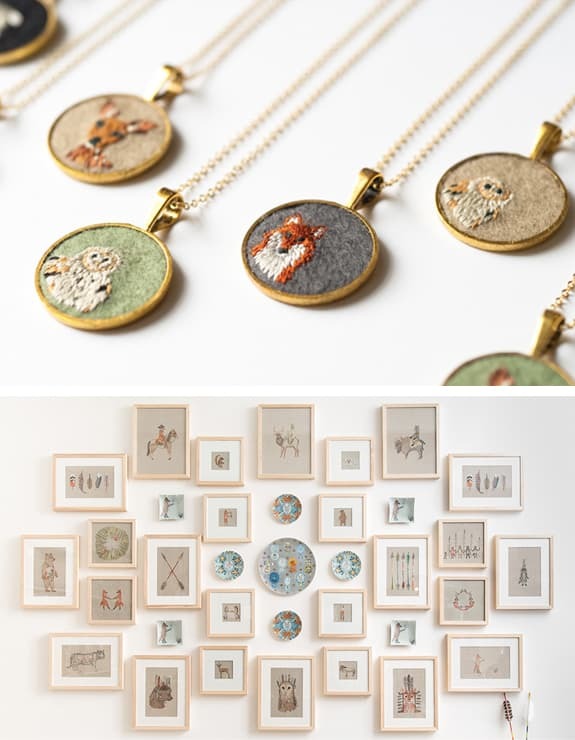 The sky is the limit when it comes to embroidering. 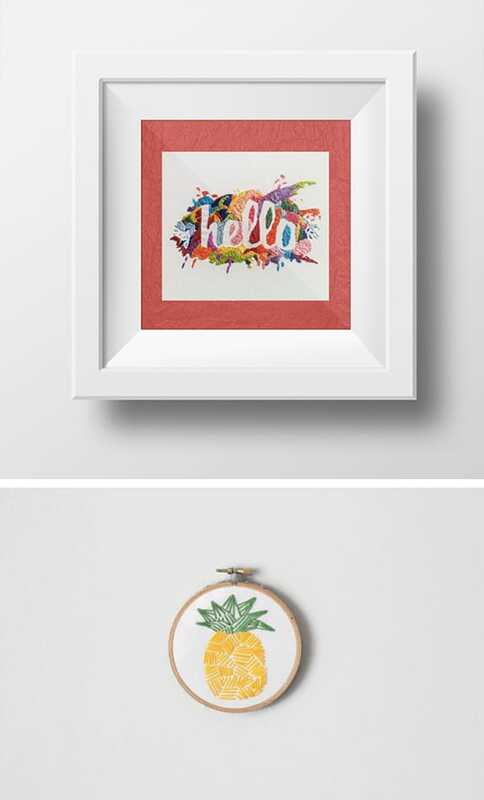 If it’s fabric, it’s pretty much embroiderable (that’s totally not a word) and online stores (like Etsy) are chock full of interesting hand embroidered items like embroidered jewelry, and framed embroidery. 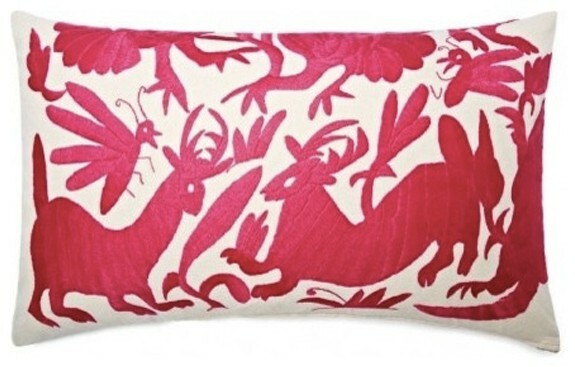 and my personal favorite, embroidered pillows. Embroidery is a relatively easy skill to learn and there are some great patterns out there. I like Urban Threads for all sorts of fun and stylish patterns. They offer a few tutorials, as does Sublime Stitching. I hand embroidered this pillow for my nursery and it’s easily one of my favorite things in there (next to the baby). Last but not least is shag! Not the hairstyle, but the rug (no, not that kind of rug), as in carpet. This is one style that is back and better than ever. 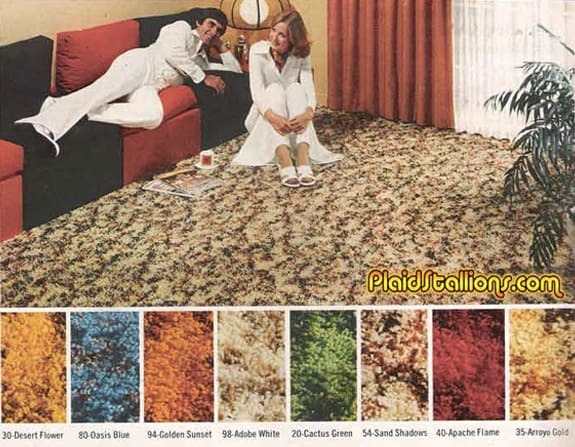 We (and by we, I mean the whole world) is extremely fortunate that this old style of shag hasn’t come back. 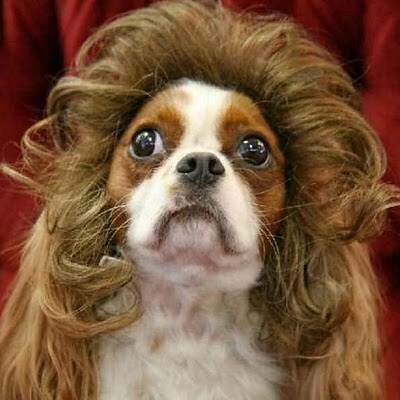 The new kind of shag is much more subtle and sophisticated. 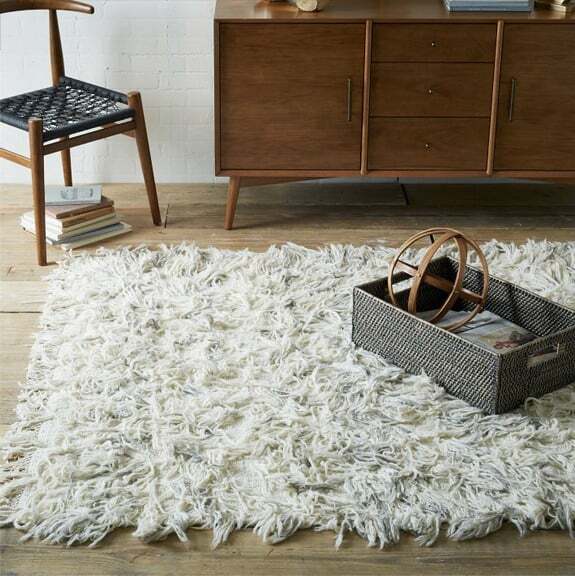 Shag rugs are so soft and luxurious you can’t help but want to walk around on them barefoot or take a little nap. 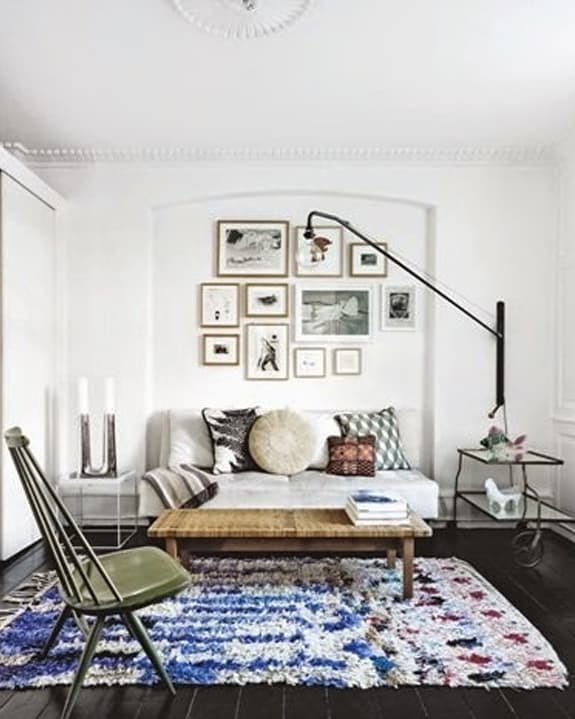 Subdued colors and simple patterns make these rugs easy on the eyes and a cohesive addition to just about any design. 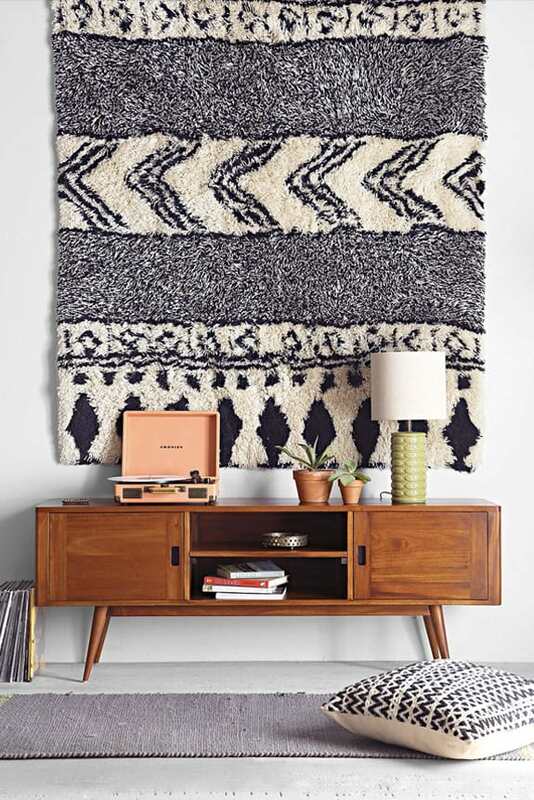 Even adding a little more color turns this rug into more of a focal point rather than just a base for furniture. Thankfully, we aren’t seeing the solid orange (which we found remnants of in our house) or avocado wall to wall shag, and hopefully we won’t anytime soon. Are you loving the shag or do you think it needs a haircut? All in all, I hope each of these trends stick around for awhile. 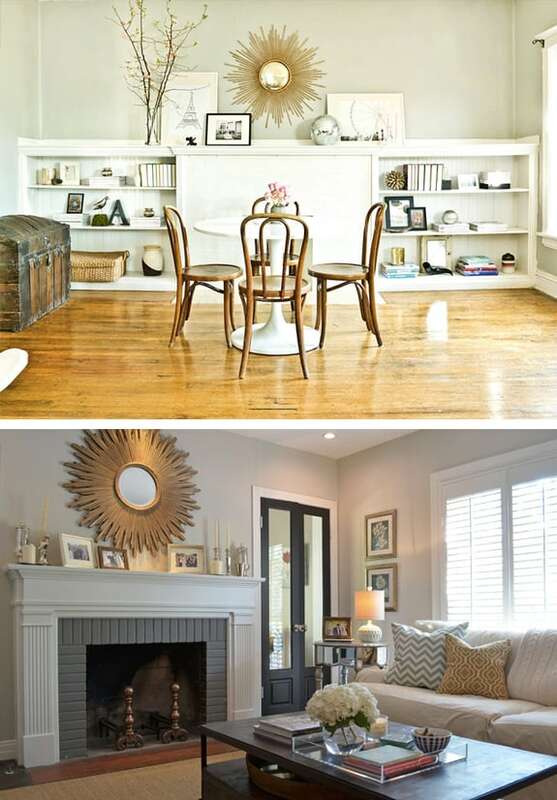 I have adopted each one and incorporated them into my own home’s style and I love it all. Give these trends a try and I’ll bet you’ll love them as much as I do! I think it’s fun to bring stuff back but I love the fact that they all have a fresh spin. Love the embroidery! The sunburst mirrors really take me back. We had one in our living room when I was growing up. I love all of the style in these photos. 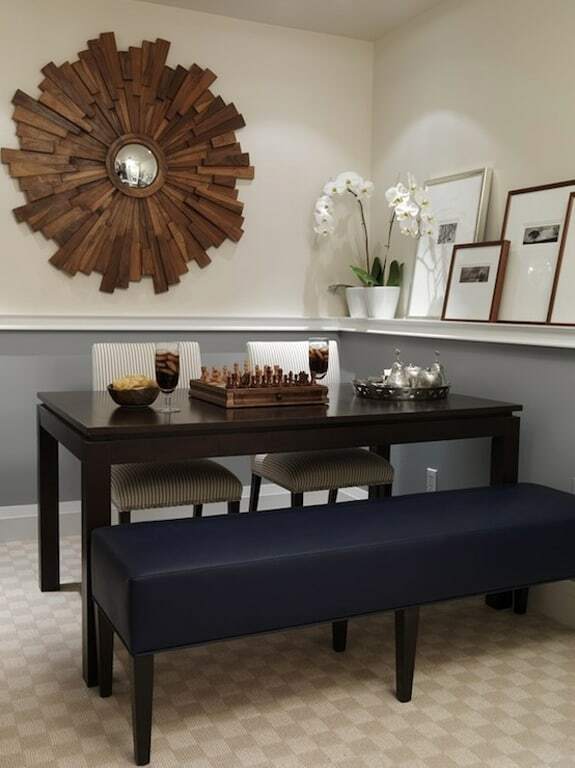 But I’m DYING over the solid wood coffee table. I love those sunburst mirrors! Great post! Ha ha! The picture of the people on the carpet is the best! I love some of these though, like the wood starburst mirror!